Institutions: Laboratoire d’Astrophysique de Marseille, Institute d’Astrophysique de Paris, Observatoire de Haute-Provence. In the search for planets around other stars, astronomers have stumbled upon a class of planets called “hot Jupiters,” which are large (like Jupiter) and close to their parent stars (and thus hot). What makes these planets interesting is their absurdly low densities, some of which are less dense than styrofoam! How did these planets achieve such low densities? These planets have been “inflated” due to an additional heat source, possibly from the tidal energy of the star or stellar radiation on the atmosphere. While the source of the hot Jupiter inflation remains a mystery, the plethora of inflated hot Jupiters testifies that inflation is common. However, not all hot Jupiters are inflated. Santerne et al. (2011) report the detection of a non-inflated hot Jupiter. This planet, formerly planetary candidate KOI-196.01 in the “Kepler Objects of Interest” (KOI) catalog, was discovered by the Kepler Mission and confirmed by the authors, who used high-precision radial velocity measurements from the SOPHIE instrument at the Observatory of Haute-Provence to calculate the mass of the planet and confirm its planetary nature. By supplementing the publicly available light curves from the Kepler Mission with their measurements from SOPHIE, the authors were able to very precisely determine the mass and radius of both the star and planet. The planet is 0.49 Jupiter masses and 0.841 Jupiter radii, giving it an average density 1.02 grams per cubic centimeter. For comparison, Jupiter has an average density of 1.326 g/cc, and liquid water has 1.0 g/cc. Compared to other Jupiter-like planets with the same orbital period, KOI-196b is both less massive and smaller (as shown in figure 9 of the paper). Why is KOI-196b not inflated? The authors suggest that the planet’s high albedo might be responsible. Albedo is a measure of the reflectivity of a surface, ranging from 0 (reflects no light) to 1 (reflects all light). The authors measure the geometric albedo of KOI-196b from the Kepler light curve. As the planet orbits the star, the light reflected from the planet toward the observer waxes and wanes due to the changing geometry of the system. (This is analogous to how the moon waxes and wanes as it orbits the earth.) The authors calculate the albedo of the planet from the resulting variability of the reflected starlight. KOI-196b has an albedo of 0.3, which is significantly higher than the albedos of other hot Jupiters, which are typically less than 0.1. 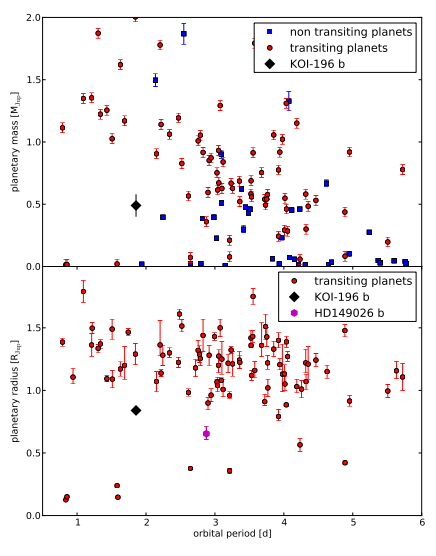 Why is KOI-196b more than three times as reflective as other hot Jupiters? The authors note that sodium and potassium are expected to be abundant in the atmospheres of giant planets close to their stars. These elements increase the atmospheric opacity and decrease its reflectivity. The depletion of these elements could be responsible for the increased albedo of KOI-196b. Alternatively, the high albedo could result from a layer of reflective silicate high in the atmosphere. However, there is a caveat to the determination of the albedo: thermal emission from the planet could also contribute to the light curve and could thus be confused with the reflected light. The authors calculate the maximum possible thermal emission from the planet in the wavelengths observed by assuming that the planet is a blackbody and find that the thermal emission is negligible compared to the reflected light. However, they emphasize that time-series photometry in the infrared is necessary to measure the planet’s thermal emission. Assuming that the planet indeed reflects 30% of the incident starlight, its temperature should be about 1930K on the day-side. 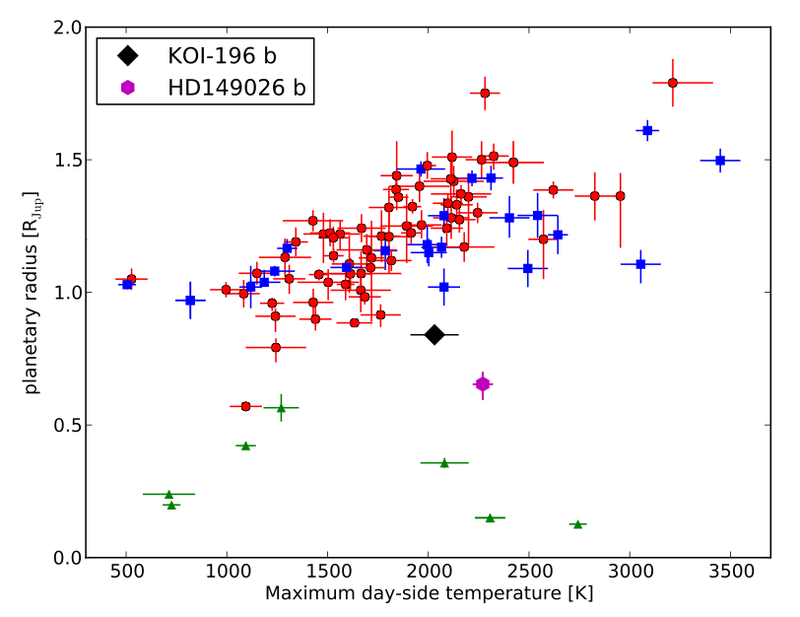 The temperature and radius of KOI-196b are shown in comparison to the temperatures and radii of other hot Jupiters in figure 10. If the temperature of the planet is responsible for its inflation, KOI-196b’s cooler temperature could explain its failure to inflate. However, because the mechanisms that cause inflation are unclear, we cannot be sure whether KOI-196b is a hot Jupiter that failed to inflate, or a hot Jupiter that has deflated as the planetary system evolved.